Our First Class – Deluxe Saloon standard is the very sleek and luxurious Mercedes-­‐Benz S-­Class. It is instantly recognisable not only for its iconic style but it is a car synonymous with class, comfort and style. Being chauffeured in this car is a delight; from the interior to the fittings this car excites and relaxes. 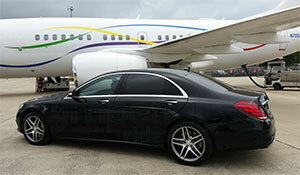 Use this luxury service to transport your VIP guests, and corporate clients. It makes for a memorable ride with added comforts. This is the first choice for VIP travel. Safety and precision are key features of this vehicle that offers security for both passenger and driver. Ambient lighting, thermotronic climate control, panoramic sunroof, reclining headrests, massaging features in the back seat are just some of the comfort features in the S-­Class. Sit back and relax in this luxury vehicle.